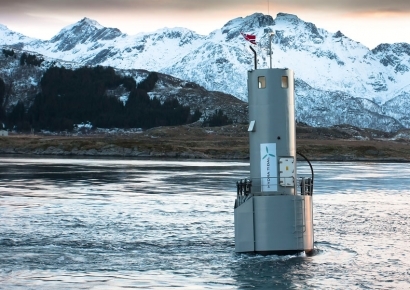 The Morild II tidal power plant has a unique and patented floating design that can be anchored at different depths, thus can be positioned in spots with ideal tidal stream conditions. There are four turbines that transmit power via hydraulic transmission to two synchronous generators. Each turbine is composed of two unique wooden turbine blades that can be pitched 180 degrees to utilize energy in both directions. The plant carries sea vessel verification, and is both towable and dockable, allowing maintenance in surface position and on site. The prototype transmits energy with an undersea cable and can be remotely operated from on-shore surveillance systems. The Gimsoy stream (Gimsøystraumen) in Lofoten, Norway. Hydra Tidal was founded in northern Norway in 2001. In autumn 2010 the MORILD II tidal power plant was successfully launched at sea and towed into location in the Gimsoy stream in Lofoten, Norway. In December 2010 the plant (1.5 MW capacity, four turbines) was thoroughly prepared, anchored and submerged into operational position. The opening ceremony marked the start of the planned two-year trial period for testing and verification. Due to some fatigue issues with the rig in 2011, the plant was recovered. The Morild II is currently (September 2014) out of service. The continuation of the demonstrations will be done through the company Straum AS. The environmental authorities have several important tools at their disposal in connection with activities in the Barents Sea–Lofoten area. For Norway’s territorial waters these are mainly based on the Nature Diversity Act, while for Norway’s exclusive economic zone and the Norwegian continental shelf, the most important tools are based on the Pollution Control Act, political action plans and strategies. Areas of concern include: marine protected areas, protection of seabirds, priority species, selected habitat types, alien species, and interference with shipping lanes. MORILD II Tidal Power Plant is located in Norway. Comparison of carbon dioxide emissions with similar wind projects. Life cycle analysis of production and assembly, transport, operation and maintenance over the life span and recycling at the end. Carbon dioxide emissions are 40% lower than that of onshore wind. Discover how much waste will be created in the decommissioning of the plant. Design engineering and analysis of materials. 80% of the plant can be recycled after its life span, which is more than 30 years. For example, our turbines are made out of glued wood. This material can handle tough ocean environments and they last very long. After the turbines' life end, they can be chopped and used in a bio energy power plant for example. Hydra Tidal has, in cooperation with Harstad University College and Kunnskapsparken Nord AS (Science/Competence park), made a report about CO2 emissions in connection with the production of a complete Morild power plant.